Want tosave 0,75 kn on this order and become Loyalty program member? 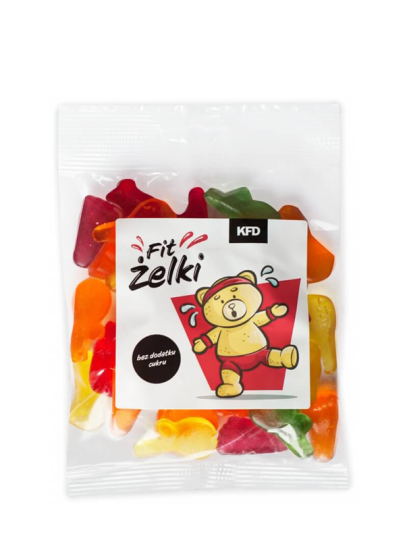 Fit Jelly Candies are a novelty devoted to all candy lovers! No added sugar with high fiber content and a small amount of calories compared to traditional products of this type. Fit Jelly candies are made as a mix of sweet, fruity flavors in 6 different shapes! Sweetener: maltitol syrup; inulin, pork gelatin, acidity regulator: citric acid; Colors: anthocyanins, pepper extract, copper chlorophyll and chlorophylline complexes, carmine acid; saffron extract, flavoring, solvents: beeswax, carnauba wax; vegetable oils (palm, coconut).